You are currently browsing solomonzori’s articles. Who pays and who free rides? International Free Rider Reporting Standards or International Financial Reporting Standards. The idea of international financial reporting standards as a single global financial reporting language has come to stay. There is no doubt that developing accounting standards can be a difficult and expensive exercise. The substantial cost associated with the development of international accounting standards seems to be borne by only a handful of actors where as other actors (users of the standards) are free riding. Who pays and who free rides? The International Accounting Standard Setter i.e the IFRS Foundation thrives as a non-profit private organization who’s business is to commit its rather limited resources solely to the development and promotion of the use of high quality global financial reporting standards. These resources largely come from the generosity of member countries, international organizations, international accountancy firms, accounting regulators, capital market regulators, multinational firms, transnational and national accounting standard setting bodies, international banks and in rare cases governments. Given these rather limited sources of financing and the lack of obligation on the part of these sponsors, it is hard to say how much funding the IASB actually needs to enable it develop credible global accounting standards. However, a quick look through the financial statements of the IFRS Foundation suggests that majority of its funding turns to come from accountancy practicing firms, national accounting regulatory authorities and accountancy bodies that share the dream of a single global accounting standard. These sources of funding got me thinking about the wide usage of the standards as to the number of user countries and the limited funding the IASB currently has. As many as 120+ countries currently use IFRS globally. However, very few of these countries actually contribute financially to the development of these standards. What is even more surprising is the number of developing countries (especially countries from Africa, Asia and South America) that continue to use the standards without any financial contribution to the development of the standards. Take Africa for a test case. There are 57 countries in the continent and out of this number; about 21 countries currently use IFRS in one form or another either as full scale adopters or users of modified versions of the standards. Nevertheless, only two of these countries have contributed very small amounts to the overall development of the standards. In 2010, South Africa became the only African country to have contributed 45,112 British pounds sterling representing only 0.27% of the income of the IASB. This example was followed by Nigeria in 2011 who contributed 62,445 British pounds sterling representing 0.30% of the annual income of the IASB. 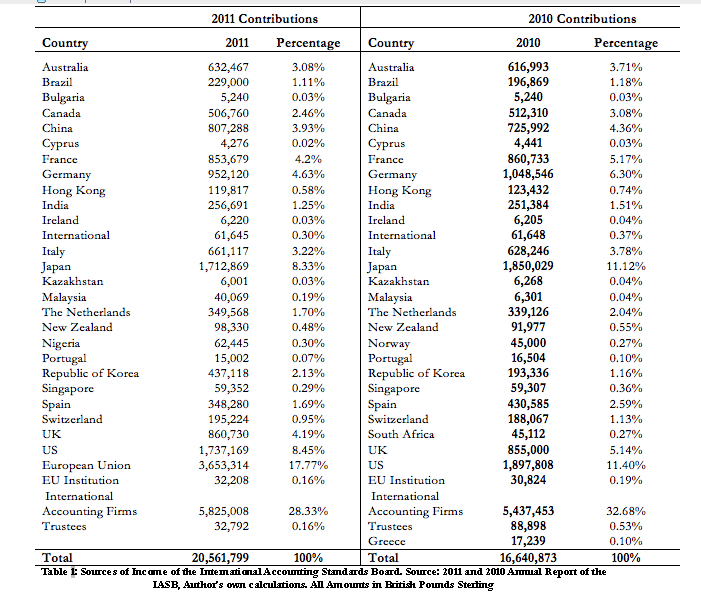 The table below indicates the sources of funding for the development of International Financial Reporting Standards. The one who pays the piper calls the tune! I have often wondered how non-paying users of International Financial Reporting Standards (IFRS) could have influence on the work of the International Accounting Standards Board (IASB). As more countries continue to apply IFRS without contributing to its development, their ability to influence the work of the IASB become weak. Neither can they communicate problems with specific standards nor can they determine the direction or pace of international accounting standards. Accounting standards by their nature are public goods i.e. the consumption of which by one party can not diminish the consumption of another party of the same good. Nevertheless, what constitutes how a public good is constructed is on the bases that a common contribution is made by consumers or potential consumers of the same good. But this contribution is only made by a cross-section of the consumers while the others only wait to enjoy the benefits. On this basis, economists define public goods to mean any good from whose enjoyment non-contributors cannot be excluded. Like many other public goods, the problem of free riding exists where some others pay to finance its construction while others do not pay but enjoy its use as much as those who paid for its construction. IFRS has come along with such economic problem. IFRSs on this basis have equally come to represent public goods which only a handful of financial contributors make commitments towards the development of the standards while others only apply the standards without any contribution. As many developing countries look to enhance their financial informational needs, they turn to embrace the idea of IFRS and adopt these standards in some cases without the knowledge of the IASB. The price for free riding the use of these standards is that, actors that contribute the development of these standards turn to dictate the direction of the standards. Non-paying actors will have no influence on how these standards are designed. With little or no voice on the IASB standard setting process by non-paying members, this group of users of the standards stands the chance of applying standards not designed to meet their needs. In my last blog entry, I referred to the chameleon nature of the description of IFRS adoption in many countries. I described the contradictions that the International Accounting Standards Board (IASB) presents when it refers to the overwhelming acceptance of the International Financial Reporting Standards (IFRS) globally. This contradiction and confusion generates ambiguity in the application of the standards in most less developed countries that seem to apply the standards from different angles than anticipated by the IASB. This in turn has the potential to undermine the achievement of the benefits of these standards as presented by proponents of IFRSs. The question is, how different or similar will the outcomes (results) of IFRSs application(s) be if some countries adopt IFRSs without modifications as compared to those that apply modified versions of the standards? Will the IASB be able to achieve the goal of comparability of financial statements across borders? Will the need to harmonize accounting practices globally in order to achieve uniformity be fulfilled? The aim of this blog entry is to reassess the claims that countries and the IASB make when they speak of IFRS adoption, looking for the best way to gauge if and when a country has actually adopted IFRSs. Let’s start with the basic premise that a single global accounting standard has the prospects of improving information quality across borders and to foster cross border investments. This premise rests on the notion that granted that a single global accounting standard is in place, comparability of financial statements will be achieved, leading to a reduction in information processing costs associated with different national accounting standards, and thereby resulting in a reduction in the overall cost of capital. There is great ambiguity on the true representation of the ‘’adoption’’ of International Financial Reporting Standards (IFRS). What constitutes the ‘’adoption’’ of IFRS? At what point can a country, company or entity claim to have adopted IFRS? What is the best measure for IFRS adoption? International diffusion literature and transnational governance literature provides insights as to the point of departure of how global norms are translated into local laws. It suggests that laws, norms, ideas or global regulations when diffusing turn to be reshaped and edited as they are transformed into local practices. To be exact, actors translate ideas, recombine new, externally given elements and old locally given ones to form local laws. Scholars in this arena argue that, in this context, never can we suggest that passive adoption of global standards has taken place. Yet, in many other contexts, actors at both the local level and the transnational level have tended to refer to such process as ‘adoption’ as opposed to a reflection of the variant of the law, idea or norm so implemented. In many cases, only portions of the diffused law or standards are implemented. Nevertheless, actors often refer to such as adoption as opposed to a modification of the diffused law. At other times, different actors refer to the modification of the diffused law as the adaptation of the law. This ambiguity so created has led to mixed results when looking into the idea of International Financial Reporting Standards. In the global accountancy arena there have been several calls for the world to embrace the idea of a single global high quality accounting standard- thus IFRS. These calls have been stronger following the recent financial crisis as the world continues to pursue globalization strategies and capital flows across borders became even more pronounced. In this direction, accounting standard setters have been working to design high quality accounting standards that is applicable by nearly every country irrespective of the unique economic and cultural conditions that confront these entirely diverse countries and continents. These standards promulgated by the International Accounting Standards Board (IASB) has however, been applied in different ways than that put forth by the global accounting standard setter (IASB). In this blog entry, it is my aim to try to provide some lines of reasoning on the true meaning of IFRS adoption. I do not claim that this is the first of such arguments. However, it is my claim that global standard setters, local actors responsible for the implementation of IFRSs have often referred to entirely different versions of IFRSs when referring to IFRS adoption. If indeed IFRSs were adopted, we should expect a single version of the standard in all the jurisdictions that claim to have adopted the standards. The State of IFRS in Africa: Is IFRS in Disarray? Why should Africa adopt IFRSs? Adoption is less of the story.. not practicing what you preach is the bigger evil. In the past decade the rise in the use of the International Financial Reporting Standards (IFRS) in many countries around the world has moved the wave towards developing countries considering adopting these standards. Factually, about 120 countries presently use IFRS across the globe. Out of this number about 13 countries in Africa have already adopted (i.e as issued by the IASB without any modification) or adapted (.i.e with modification to meet local socio-economic needs of a particular accounting jurisdiction) to IFRS. A diverse Continent a uniform accounting standard? Primarily, former Anglo-Saxon colonies have adopted IFRSs. However, it is quite surprising that Africa as whole is considering adopting IFRS given the chaotic nature of these standards on the international front and the often unseen justification given for the adoption of IFRS particularly in Africa. Many international organizations like the World Bank , the World Trade Organization , USAID and UNCTAD have all been arguing for the adoption of IFRS in less developed countries . 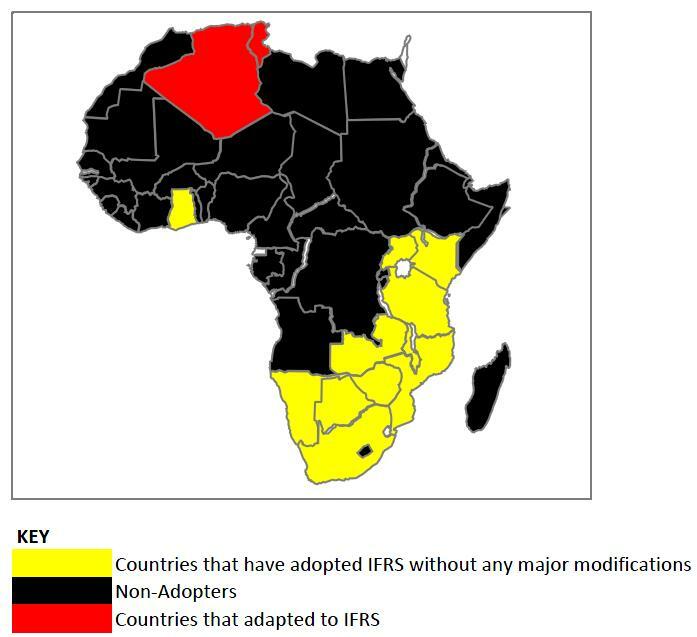 There are many reasons why Africa should not adopt IFRS. I will try to explain and to some extent justify this line of reasoning. First, the merits of IFRS often mentioned include, improved comparability and uniformity of financial statements among companies and countries, resulting in a decrease in the equity cost of capital, improved transparency, a decline in information processing cost and a reduction in risk of international investment decisions amongst others. Whilst these benefits look very desirable, it is also the case that these benefits cannot be reached in every economy. To be clear, IFRSs were designed for developed and matured capital markets. At least the economics speaks for itself. It is an undeniable fact that financial statements assist investors in making critical investment decisions. As pointed out in the general purpose of financial statements in the conceptual framework of the IASB, financial statements should aid users in valuing securities, be it when buying or when selling. The argument for the use of IFRSs in developed countries in plausible. However, what I find puzzling is the push for IFRS adoption even in countries that have no stock markets or stock market listed companies. I do not deny that quality financial reporting should be present in economies where there are no capital markets. But I also admit that such countries have totally different financial reporting needs than industrialized countries. Accounting systems of a country are traditionally shaped by its socio- economic, cultural and political environment. Some economies are totally different from others and therefore we must recognize that these differences in accounting needs shape financial reporting.